Organized packers, we've found the perfect toiletries bag in the AmazonBasics Hanging Toiletry Kit. One of the biggest challenges of traveling is organizing your luggage. I'm all about minimalist travel, but it can be tough to condense even the smallest loads. And the most difficult bag to pack may be a toiletry bag. There are just so many factors to consider! Which medications will you need to bring? Is bar soap or liquid soap better? Is it necessary to bring along that dry shampoo? The questions can become so overwhelming that we just end up throwing everything into a giant ziploc bag and calling it a day! But then, I found the AmazonBasics Hanging Toiletry Kit. And my traveling life changed. The AmazonBasics Hanging Toiletry Kit is so easy to organize. It's also light-weight and easy to carry. And you will finding your travel mornings will be much more relaxed knowing where every toiletry essential is located. In this AmazonBasics Hanging Toiletry Kit review, we will go over the pros and cons of this travel item. Luckily for you, the good outweigh the bad when it comes to the AmazonBasics Hanging Toiletry Kit. I've never been an organized traveler. And I've also never been a light packer. Typically I end up just throwing a bunch of things I think I might need into a suitcase. Of course, I always wish I had packed more carefully later on. But I'm probably the worst at packing a toiletries bag. I just never know what I'm going to need! And in the past I've only used travel toiletry kits that are just one big pocket. It's difficult to organize, and I end up losing half of my things. I gave up hope on ever becoming an organized packer. But then I realized it wasn't me. Well, it was sort of me. But the real problem was the luggage I was using. I needed a toiletry bag with many pockets and organizational spaces. And it needed to have handles so I wouldn't have to carry my toiletry bag under my armpit anymore. Finally, the bag needed to be light-weight and easy to pack so my bag wouldn't have too much extra weight. I ended up finding all these things in the AmazonBasics Hanging Toiletry Kit. The best part about the AmazonBasics Hanging Toiletry Kit is how much storage it has. This makes it so much easier when packing up toiletries. Honestly, do you know how much time you can save by not packing hair products and make up items in the same pocket? The separate compartments in the bag are straight-forward and easy to locate. Inside, an internal mesh is knitted over pockets to make it easier to spot packed items. And another perk of the mesh is that it expands to make it easier to pack bulkier items. Let's be honest: one of the biggest packing inconveniences is when shampoo spills. That's why another organizational feature that we love about the AmazonBasics Hanging Toiletry Kit is that the pockets are lockable. This helps avoid the risk of any liquids spilling inside. The lockable pockets also add more security and hold items in place. Finally, there are additional external compartments on the AmazonBasics Hanging Toiletry Kit. There really is so much storage space in this bag. And you'll find this helps keep things neat and organized on your journey. A great feature of the AmazonBasics Hanging Toiletry Kit is its handles. This makes the bag so much easier to carry and travel with. What's more, the AmazonBasics Hanging Toiletry Kit can also be hung up. This is one of our favorite features about this product, aside from its incredible organization. The ability to hang the AmazonBasics Hanging Toiletry Kit makes it easier to sort through the bag and locate toiletry items. In the past, I've usually been stuck with using toiletry bags I have to lay out on the ground before finding something. Having the ability to hang my toiletry bag made my life so much easier. It might sound like a small perk, but it makes a world of difference. And that's especially true if you're crashing in small spaces. Personally, I get very stressed when my space is messy and unorganized. Especially if it's not my own space, like and Airbnb or a hotel room. But the ability to hang the AmazonBasics Hanging Toiletry Kit helps alleviate this stress. It makes it easy to spot any item you might need in no time. The AmazonBasics Hanging Toiletry Kit is designed to be compact and easy to travel with. And that is one of the most important features to look for when searching for the perfect toiletry bag. It can be so frustrating to have carefully packed your luggage just to have a bulky toiletry bag ruin all your hard work. Luckily, the AmazonBasics Hanging Toiletry Kit is just 9.6×8.2×3.3 inches in size. But don't let this compact design fool you. The bag may seem small, but all of its organizational pockets allow for it to hold quite a few items. And you'll find that you're able to pack items of varying sizes. For example, a hair dryer will fit in the AmazonBasics Hanging Toiletry Kit just as easily as a toothbrush. The size of the AmazonBasics Hanging Toiletry Kit is also ideal because it doesn't take up much extra space. So if you're a light packer and traveler, you might want to consider the AmazonBasics Hanging Toiletry Kit. It's great for people who want to stay organized and avoid overpacking. One downside that travelers are finding, however, is that the AmazonBasics Hanging Toiletry Kit is not the most stylish bag. It only comes in one color: black. So if you're more of a fashionista when it comes to your travel gear - or if you simply prefer bright colors - this is an important feature to note. Every compartment of the AmazonBasics Hanging Toiletry Kit is secured with sturdy zippers. The zippers have multiple perks. For starters, they're very durable and are unlikely to come undone during travel. And they're great for holding items in place. That's because the zippers are lockable, which adds even more security to this travel bag. Additionally, the zippers are strong enough to hold in bulky, heavy items without tearing. So you don't have to worry about breaking a zipper while packing up your toiletries. These zippers are sturdy and can hold a considerable amount of weight. And that means this bag can withstand many trips. So if you purchase the AmazonBasics Hanging Toiletry Kit, you can expect this item to last you a long time. The best part of the AmazonBasics Hanging Toiletry Kit is that it is affordable. There are a lot of travel items out there that have wonderful features, but just aren't in an ideal price range. But the AmazonBasics Hanging Toiletry Kit retails at just $16.99 on Amazon. And that's a tough price to beat. Travelers are loving the AmazonBasics Hanging Toiletry Kit for many of the same reasons we are. The feature they're loving most is how much room it saves. You will find when you use the AmazonBasics Hanging Toiletry Kit that you'll hardly use up any of your hotel counter space. That's because the bag's hanger clip can hold up everything you need to grab right off the back of the bathroom door. And it can stay hanging there even when not in use, just to get it out of the way. Most travelers are raving over the bag's leakproof lining. Other reviews that earned the AmazonBasics Hanging Toiletry Kit 4.5 out of 5 stars on Amazon are due to its storage space. The biggest cons travelers are finding come down to the design and where the zippers are located. Overall, reviewers and users are saying it would be nice for the bag to come in more colors. But an aesthetic criticism like this doesn't hold as much weight as practice uses. However, an important complaint to note is that the zippers on this bag start at the bottom, not the top. Additionally, the zippers on the AmazonBasics Hanging Toiletry Kit can come undone all the way down the sides of the bag. Therefore some travelers have found they have to be extra careful when hanging up the AmazonBasics Hanging Toiletry Kit to make sure nothing falls out of the bag. Just because the AmazonBasics Hanging Toiletry Kit works for us, that doesn't mean it will work for you. And that's okay. There are so many other toiletry bags out there with just as many perks. And we're here to help you find that perfect bag. Take a look at alternative travel toiletry bags you may like more than the AmazonBasics Hanging Toiletry Kit. We promise by the end of this article, you will be one step closer to finding your dream toiletry kit! 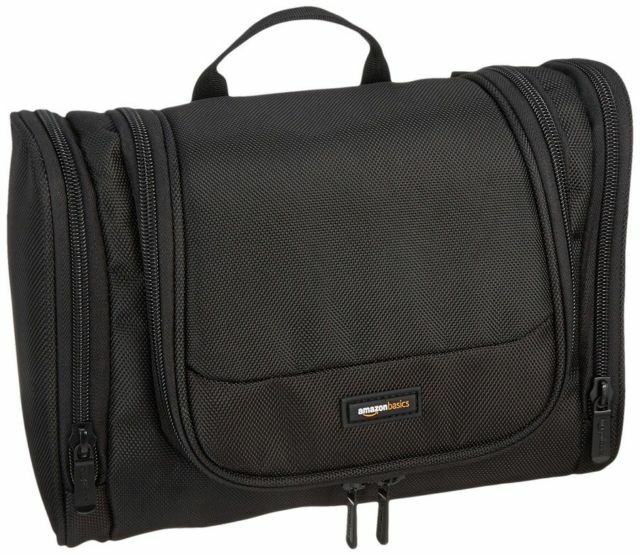 The eBags Pack-it-Flat Hanging Toiletry Kit is another great toiletry bag option. For starters, it comes in a wide variety of colors. So if you weren't a fan of the black material of the AmazonBasics Hanging Toiletry Kit, this bag may be more to your liking. The overall dimensions of the Pack-it-Flat are 2.2" x 14" x 9.2". Therefore this bag is still rather compact and easy to travel with. It also comes with four separate compartments, each measuring 2.25" x 9.25" and the center section is 7.75" wide. One feature that travelers love about the Pack-it-Flat bag is its breathable material. This helps keep the nylon fabric smelling fresh. The material is also very stretchy and durable, therefore many bulky items can fit into this toiletry bag, as well. A perk that the Pack-it-Fat toiletry bag shares with the AmazonBasics Hanging Toiletry Kit is the hanging hook. And that means you'll have an easy time staying neat and organized in the bathroom with this bag, as well. But one perk that the Flat-it-Pack bag has over the AmazonBasics Hanging Toiletry Kit it its removable pocket mirror. This is a fun, useful add on that makes this bag more convenient for on-the-go touch ups. The Briggs & Riley Baseline Expandable Toiletry Kit has the same amount of stars as the AmazonBasics Hanging Toiletry Kit, but at a steeper price. This small, compact toiletry bag measures at 11 x 7 x 3 inches and weighs a light 2 pounds. 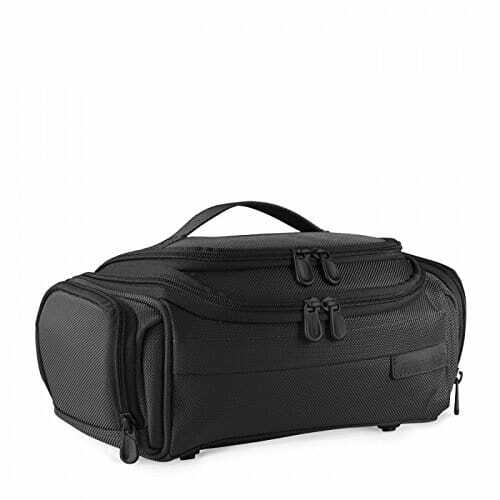 As with the AmazonBasics Hanging Toiletry Kit, the Briggs & Riley toiletry kit expands plenty and is easy to pack in suitcases, as the bag deforms a bit. Keep in mind that the Briggs & Riley bag has far fewer organization pockets and dividers than the AmazonBasics Hanging Toiletry Kit. But depending on much many toiletry items you tend to bring - or how long your trip is - that might not be a problem for you. If you're looking for ways to be more minimal when you travel, this is a great bag to consider. But regardless of how much storage you need, it's important to note that Briggs & Riley makes high-quality products. All of their bags are extremely durable and long lasting. And that's probably why they can be so expensive at time. But rest assured that your money is well spent if you looking for a small, long lasting, weekend toiletry kit. If that's what you're searching for, the Briggs & Riley toiletry would be perfect for you. Next up: the Bago Hanging Toiletry Bag! This inexpensive and easy to carry toiletry bag comes in three colors: black, bright pink, and light blue. 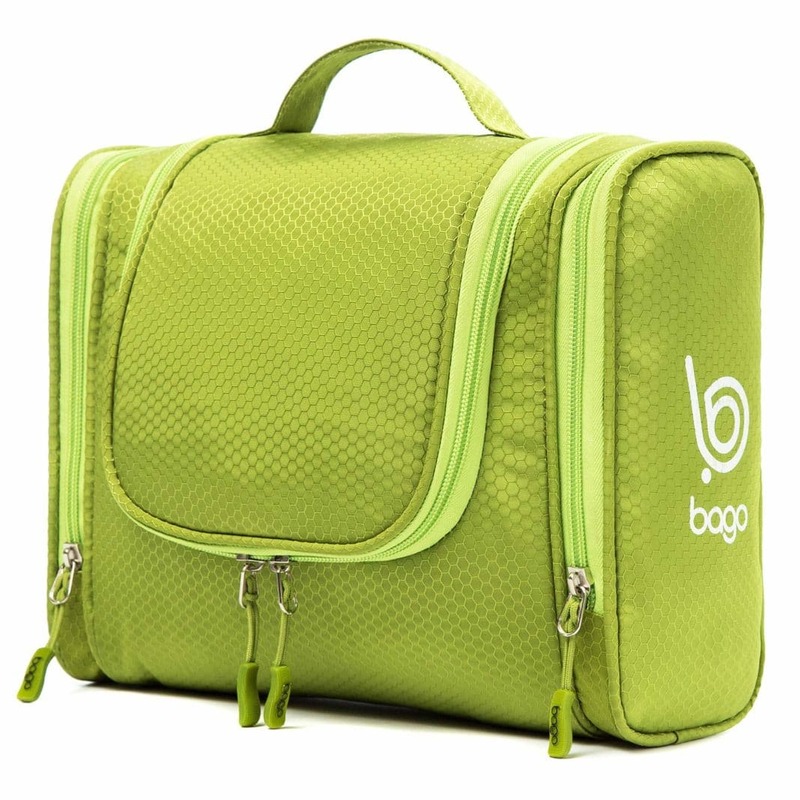 The Bago Hanging Toiletry Bag was "designed to give you options." 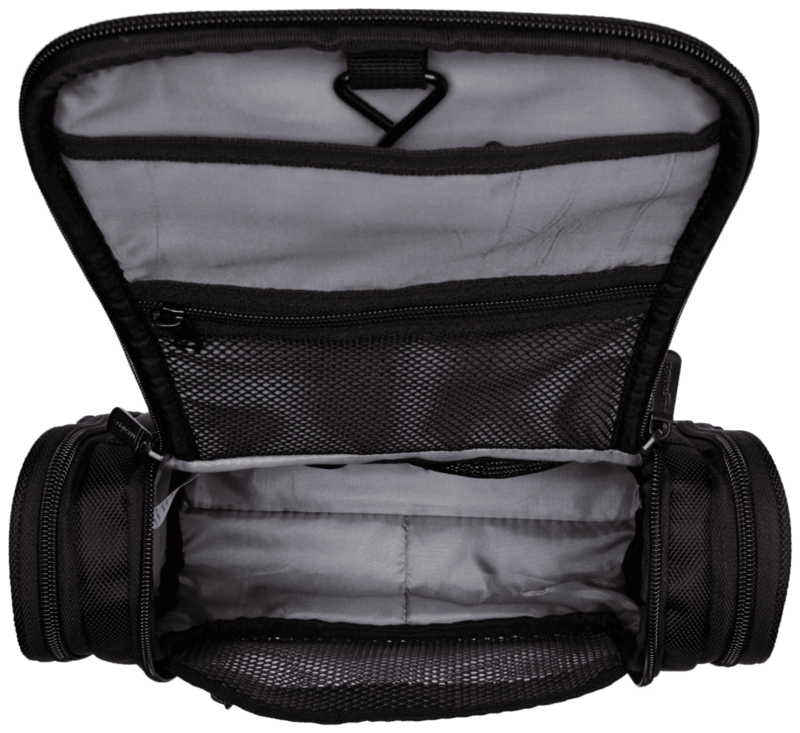 The bag has multiple pockets and organizational sections. But it doesn't necessarily need to be used as a toiletry bag. It is diverse and versatile enough to be used to store art supplies, carry electronic equipment, or even be utilized as a lunch bag. One user even found that it made the perfect gym bag. 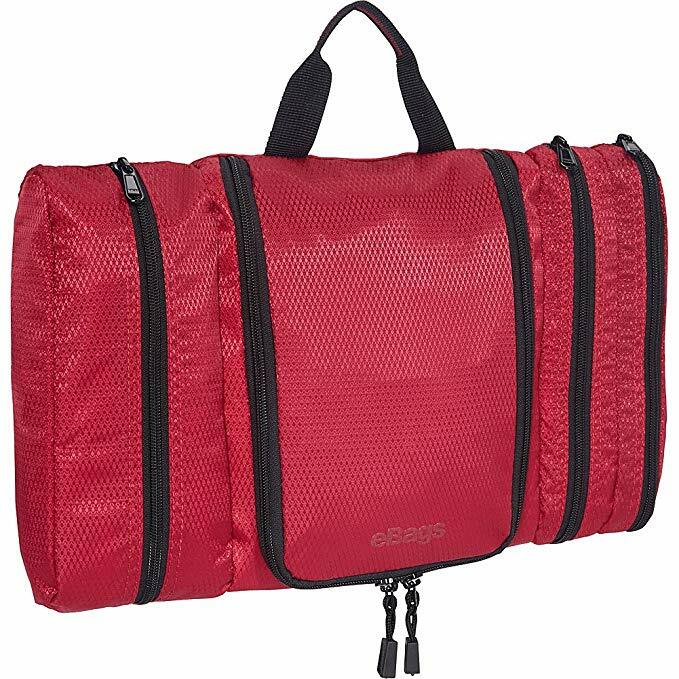 Travelers are finding that the Bago Hanging Toiletry bag is very sturdy and reliable. The biggest drawback that they're finding, however, is found in the upper, inside zipper compartment. That compartment is too small for most users to reach their hand inside. Therefore it isn't very usable in storing toiletry items. Didn't we tell you we had plenty of other toiletry bags to look into? So if you're still worrying about finding a bag for your upcoming trip, don't. We have two more options for you, starting with the Freegrace Hanging Toiletry Bag. This affordable toiletry bag retails at just $19.99 on Amazon. The bag measures at 1.02’’ x 5.52’’ x 10.24’’ in size. And the company says it's so easy to use and organize, you could use it just as much at home as you could on your trip. As with the AmazonBasics Hanging Toiletry Kit, this bag has a hook that allows it to hang up in your bathroom. One feature that travelers are loving about this bag is its lightweight body. This makes it easier to carry and pack. 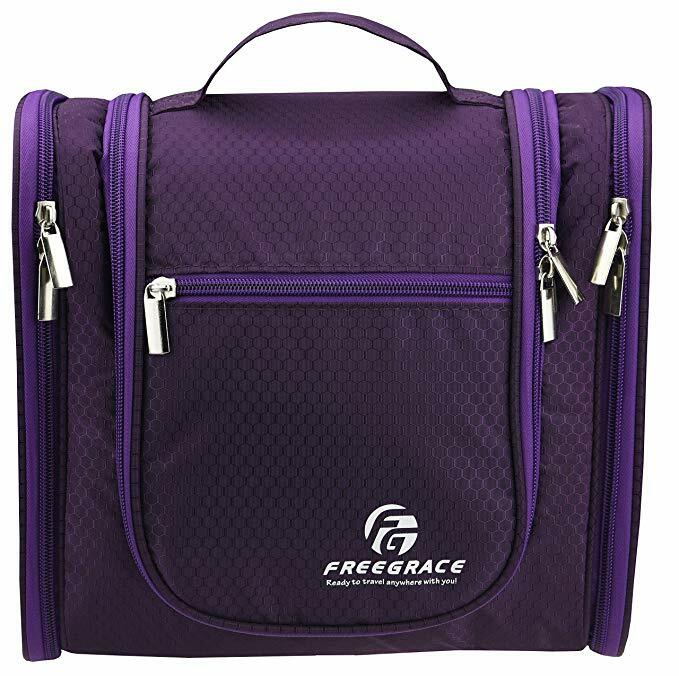 The Freegrace Hanging Toiletry Bag comes with the same amount of pockets and organizational space as the AmazonBasics Hanging Toiletry Kit. Therefore, you will find it easy to bring along all of your toiletry essentials, if you identify as an over packer like myself. One drawback that travelers are finding, however, is that the bag isn't quite as roomy as it advertises itself to be. Freegrace says this is an "extra large" bag, but for over packers, it's a pretty average size. But keep in mind that size is subjective. 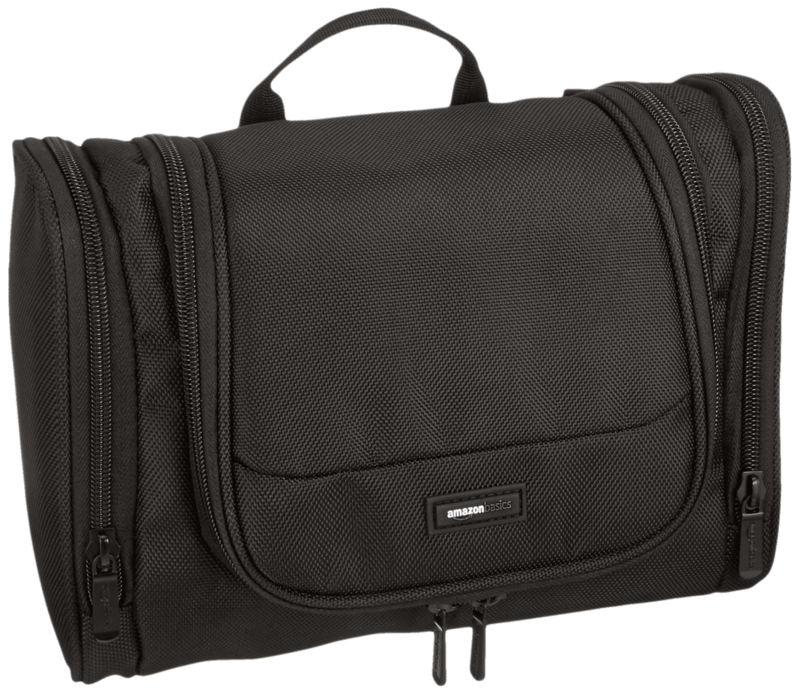 So if you're on the market for an inexpensive toiletry bag that can carry your travel essentials, then it may be worth checking out the Freegrace Hanging Toiletry Bag! The AmazonBasics Hanging Toiletry Kit is a great bag. But it's okay if it is not the product for you. And that's okay! Just because other people love a travel product, that doesn't mean it's the right item for you. And the last thing you should do is try to convince yourself to like a product. Traveling is already difficult enough to coordinate. You don't need to add any unnecessary stress when navigating yourself on a trip. But if you are in search of an affordable toiletry bag with plenty of storage space, the AmazonBasics Hanging Toiletry Kit might be a good fit. Do you have a toiletry bag that you absolutely love? If we didn't mention it on the list, please leave us a comment and let us know! We're always in search of the best travel gear to suggest to our readers.